Morning shows in Pakistan typically target the combined demographic of people getting ready for work and school, and stay-at-home adults (mostly women) and parents. 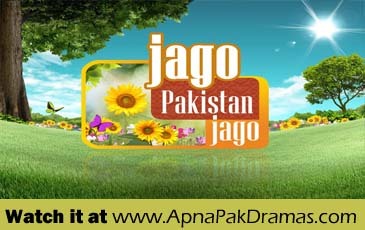 "JAGO PAKISTAN JAGO" promises a start of the new day with a warm chemistry and addictive energy. A show , that will meld entertainment & information in a way that is aimed at making the viewers entertained, informed, hopeful, and empowered. “JAGO PAKISTAN JAGO " will focus on ideas that will enhance the lives of its viewers. In the 'early part'… It will feature motivational messages, self-help tips for women, interesting news briefs and out of the ordinary national & international information wrapped in pure entertainment style. Later in the program, programming will shift to a discussion oriented format… with celebrity interviews, celebrity gossip, new reality based ideas, debatable hot issues and lots of entertainment along with audience interaction through interactive games/quizzes, emails, live calls and SMS. The topics and guests will be from across all our ranges to ensure there is something for everyone to enjoy… from beauty & lifestyle, to education and learning, to celebrity interviews and gossips like never before. To reflect on the dominantly female demographic our show will also feature women specific segments to ensure homemaker oriented entertainment. You are watching Jago Pakistan Jago from the Jago Pakistan Jago Pakistani Morning Show. Watch Jago Pakistan Jago 5th November 2018 Online and other episodes of Jago Pakistan Jago Streams in HD for Free!